With fresh juicy pears in season right now it is hard to pass up the opportunity to make the classic poached pear dessert with tea. For this recipe we used the green tea Hojicha from Japan to infuse the poaching liquid. The Hojicha adds a beautiful nuttiness and depth to dish. You can feel free to try this dish with any of your favorite teas. A few items to consider before taking on this dish. It does take time to poach pears and make the syrup and allow them to cool, roughly two and half hours, so making this while preparing dinner is not really an option. The pears keep well in the refrigerator, so you can definitely make them in advance, even the day before. When buying pears, you are looking for pears with stems to make it easy for you to move them in and out of the water. If that is not possible, you can quarter the pears and use a slotted spoon instead of serving whole. Ideally you would use ripe pears, where if you press along the neck of the pear it gives under pressure. If you cannot find them, don’t worry, you will need to poach longer in the liquid. Peel and core the pears. Start by coring the pears from the bottom so as to keep the stem in place. Using a grapefruit spoon or corer, work around the notch at the bottom into the pear with the goal of removing the seeds and hard center. It will create a hole in the pear, which helps to speed along the poaching. After coring, peel the skin off the pears and place into your pan. Heat up 4 cups of water to 185°F and put in the tea. Steep for 3 minutes. Strain out the loose leaf tea and pour the remaining liquid into the pot with the pears. Turn on the burner to about medium. The tea is already hot, so you can pour in the sugar while it comes up to a simmer. Allow the pears to simmer in the tea for at least 20 minutes, but more likely 40 minutes if the pears are not fully ripe. You can use your knife to test if they are done. The knife should insert very easily. Remove the pears from the liquid using tongs by lifting them out by the stem and put in the refrigerator to cool. Leave the sauce in the pan and turn the burner up to high to get the sauce to a rolling boiling. Reduce the heat and allow to simmer until it reduces to a syrup that coats the back of your spoon when you lift it out. This will take around 30-minutes so be patient and stir periodically to check. Remove from heat and store in the refrigerator. 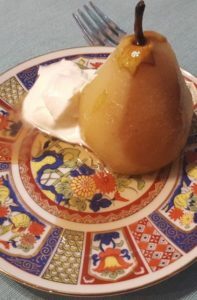 Poached pears are traditionally served cold on a plate by placing the full pear in the center, drizzling on the syrup, and allowing guests to add whipped cream if want it. This entry was posted in Cooking with Tea, Tea Recipes. Bookmark the permalink.